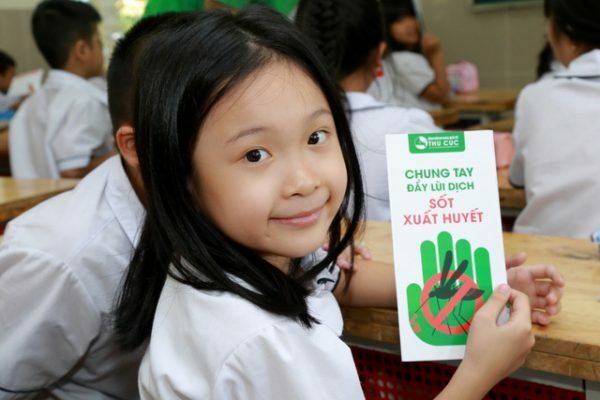 On the beginning of the new academic year (2017-2018), numerous dengue fever prevention guiding brochures were designed and delivered to primary schools in Hanoi. These meaningful gifts were excitedly received by the pupils and schools. 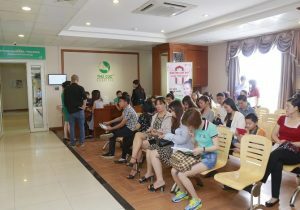 It is one of the meaningful activities in the dengue fever prevention and control campaign in Hanoi by Thu Cuc International General Hospital. 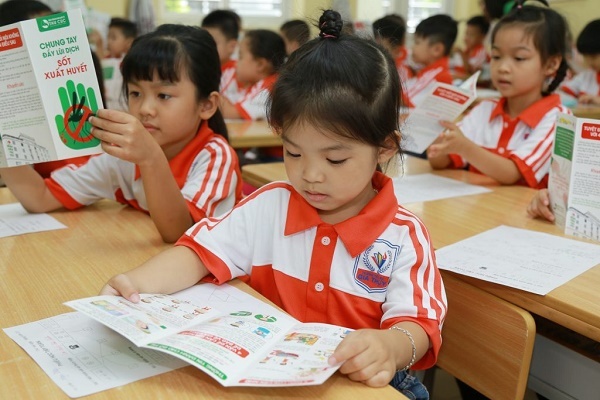 At the start of the new school year (2017-2018), the attractive and meaningful brochures from Thu Cuc Hospital have been delivered to primary schools in Hanoi. According to the hospital representatives, they will remain this activity throughout the breakout of dengue fever. 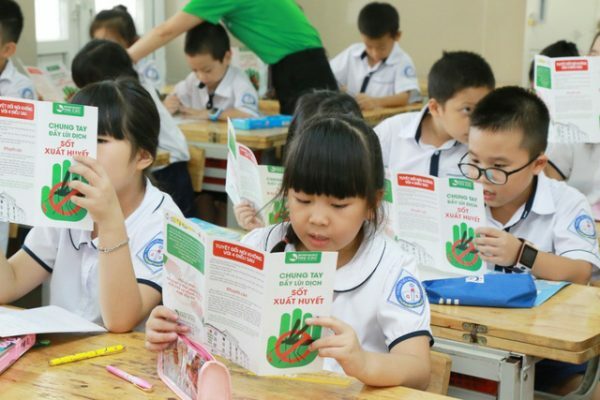 By September 18 th , more than 16,000 brochures were delivered to 10 primary schools including Gia Thuy, Phuong Liet, Dich Vong B, Thanh Cong B, Chu Van An, Hoang Dieu, Thanh Xuan Trung Primary School, etc. More and more leaflets will be delivered to children at other schools. In additions, a wide range of dengue prevention and control posters were shown at schools. With catchy and suitable designs for pupils, the vivid, meaningful and easy-to- understand brochures definitely attracted the children’s attention. 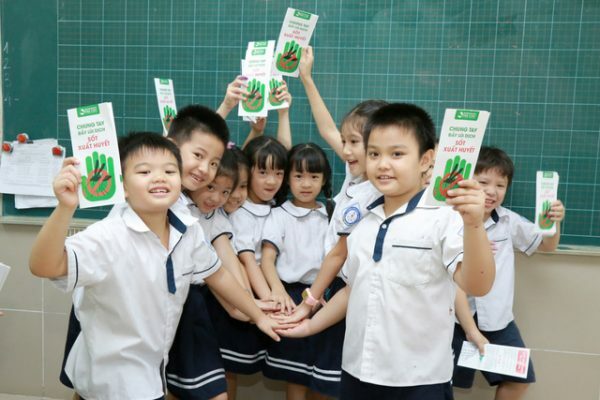 On September, 18 th 2017, volunteers from Thu Cuc Hospital continued delivering brochures to the pupils of Dich Vong B Primary School in Cau Giay district, Hanoi. Such pupils were immediately attracted by the interesting and colorful drawings which describe symptoms and treatment of dengue fever. Besides attractive illustrations, content of the brochures is also very helpful, easy to understand, easy to remember, using child-appropriate language which facilitates their understanding. Both pupils and teachers were excited with this activity. They also recognized that Thu Cuc was the enterprise donating more than 20,000 helmets to school kids last year. The delivery of these leaflets created lively discussions in the classes. They watched those funny drawings with glittering eyes and boisterous laughter. They were discussing about the drawings, raising questions about dengue fever. Equipping the children with proper knowledge to protect themselves is a practical and suitable trend of modern education. Equipping the children with essential knowledge to protect themselves is practical and suitable trend of modern education. With the background knowledge of the condition, they can handle the dangers themselves when exposed to risk factors. 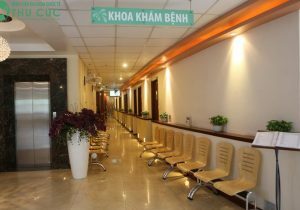 It is the doctors and medical staff of Thu Cuc Hospital who directly provide examination and treatment to patients suffering from dengue fever that be aware of the fact children are vulnerable to this disease. 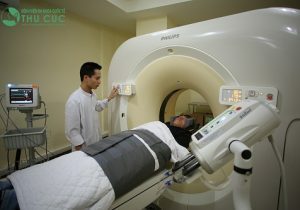 Therefore, Thu Cuc Hospital not only focuses on human resources, financial aids and medical equipment for treatment of the disease. 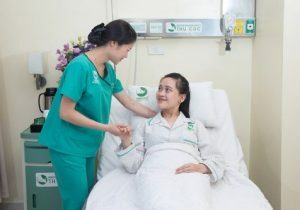 Also, medical professionals at Thu Cuc Hospital give specific explanation of the condition to customers with free consultation via the hotline number. 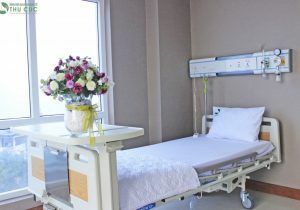 To accomplish the goal of educating, there should be the cooperation among family, school and hospital. 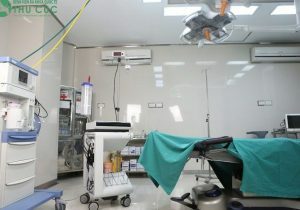 The hospital provides schools and families with medical knowledge then schools and families have the responsibility for raising the awareness among their children. The information specified on the leaflets is not only helpful for children but also for their parents and teachers. The hospital believes that with the knowledge about dengue fever equipped to every individual, it will be eliminated quickly. 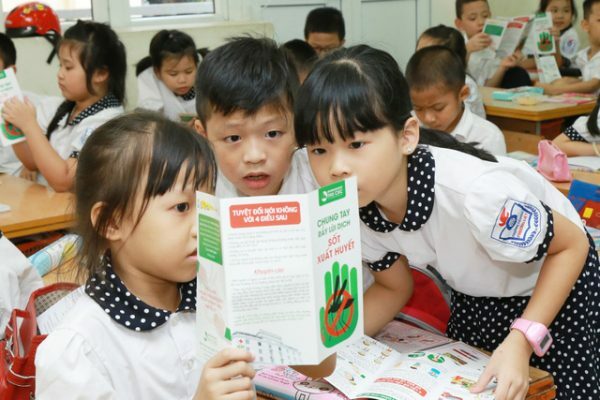 The delivery of brochures to pupils at primary schools in Hanoi is one of the outstanding activities of “Fighting against Dengue fever” campaign which is performed by Thu Cuc Hospital from the beginning of the outbreak until now.